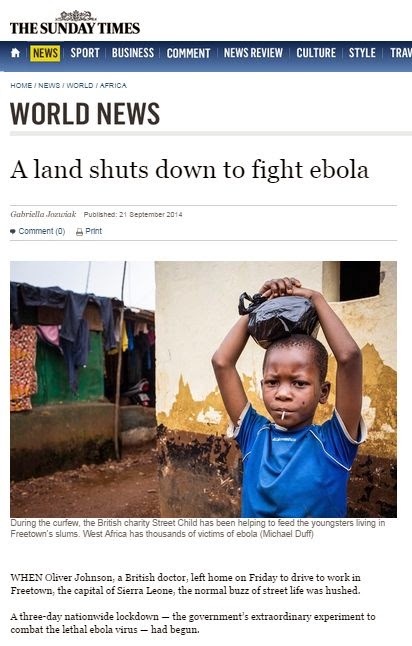 "WHEN Oliver Johnson, a British doctor, left home on Friday to drive to work in Freetown, the capital of Sierra Leone, the normal buzz of street life was hushed. A three-day nationwide lockdown — the government’s extraordinary experiment to combat the lethal ebola virus — had begun. “The streets were deserted except for small groups of people in bright white T-shirts saying ‘ebola is real’ on them,” said Johnson. Soldiers patrolled streets to ensure residents stayed indoors. Anyone moving around was escorted home under threat of arrest. Police set up checkpoints and allowed only official cars to pass..."